The Nomad of Time trilogy (The Warlord of the Air, The Land Leviathan and The Steel Tsar), compiled into one volume in this paperback edition from Gollancz is a nostalgic treat for fans of steampunk and alternative history. These three stories are the memoirs of Oswald Bastable, Captain of the 53rd Lancers and the aforementioned ‘Nomad’ on his unfortunate journey through multiple alternative versions of the twentieth century. Bastable himself was not originally a Moorcock character, but an invention of E. Nesbitt in 1899. All three books were first published as slim, thought provoking volumes, which perhaps suited their message a little better. Nevertheless, the compiled trilogy paperback delivers a veritable feast of Bastable’s adventures and is an absorbing experience to boot. The first person narrative is both engaging and flavoured. Bastable and to a lesser extent, the researcher/editor Moorcock (a version of the author and the author’s fictional grandfather) speak from the culture of their time. The British Imperial is certainly a characteristic of Bastable, but Moorcock uses it cleverly to address the issues of prejudice and democratic freedom. The weaving of real world characters into each story also provides an interesting anchor, particularly the author’s re-interpretation of Gandhi in the second book. In each book, the horrors of war and the depths to which mankind will sink to ‘win’ are explored and the well described devastation, particularly in the Steel Tsar invokes Wells’ narrator wandering around the ruins of England. Aside from the characterisation, there is a certain dated and expansive air to the writing which is bound to happen over time, but if you accept this, the text becomes an absorbing treat. New readers might approach the stories through experience of more modern, pacier works, but accepting Moorcock’s trilogy for what it is – a set of stories written in the 1970s – is important to get the most out of Bastable’s adventures. What Moorcock delivers is a multi-faceted exploration of the human condition without pulling punches. The veneer of civility and decorum of the British Imperial slips at times and Bastable’s viewpoint as both witness and victim of fate, allows the writer to explore many ‘what if’ propositions in the plot as well as exploiting character flaws in the alternative contexts. Generals Hood and Shaw are particularly good examples of this as characters presented as adversaries and villains at a distance, but who become much more nuanced when encountered up close. 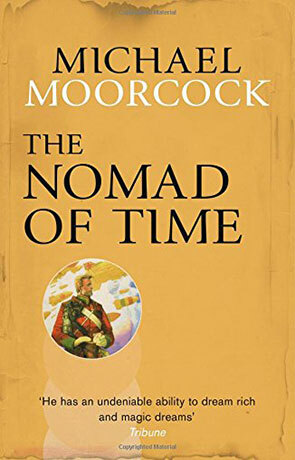 The Nomad of Time trilogy fits neatly into Moorcock's Eternal Champion mythos, with the usual selection of character cameos appearing throughout the stories. Fans will note these, picking out the different incarnations of Una Persson and thinly disguised references to Jerry Cornelius. However, the stories also stand up nicely on their own and paint a vivid picture of what the world might be like in each individual time strand. Reading each story requires some escapist suspension and acceptance, but once achieved, the experience is imaginative, speculative and thought provoking even now. Written on 2nd October 2014 by Allen Stroud.